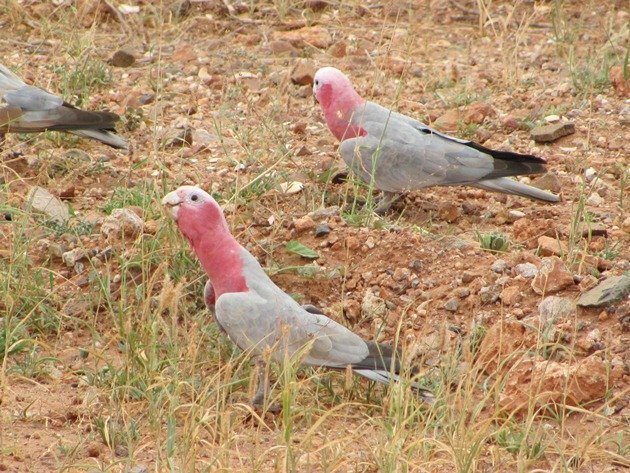 The most widespread of all cockatoos in Australia is the Galah Eolophus roseicapillus and we have them here in Broome, though we don’t always see them in town. 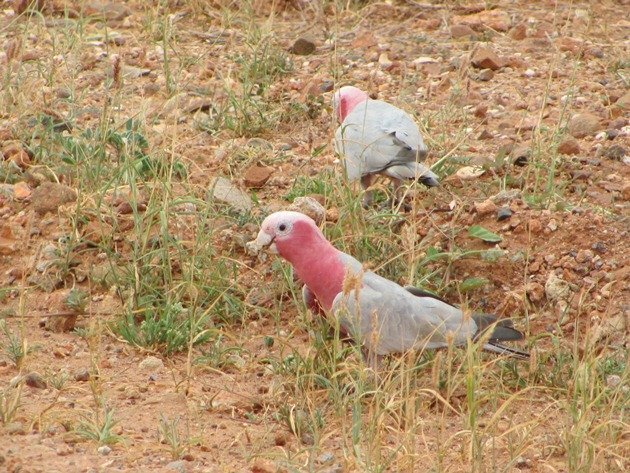 They are incredibly pink fronted with grey wings and you really appreciate the brightness of the pink when you see them alongside the more subtle Major Mitchell’s Cockatoo. 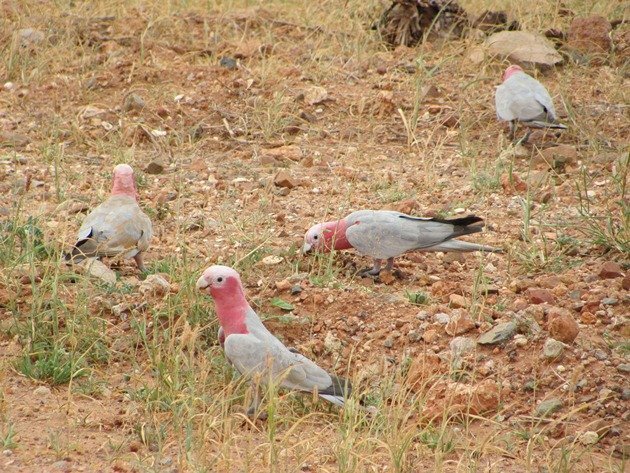 The Galah varies in colour throughout Australia and the birds we have around Broome are much paler than the birds we observed in Queensland earlier this year. They are seed eaters and they are often observed on the ground eating seeds and will use their claws to pull down seed heads. In flight they often tilt, so you observe the pink of their fronts and then the grey of their wings. Invariably they will be vocal as they fly around in large flocks and even as they roost they will be vocal rather than discreet! 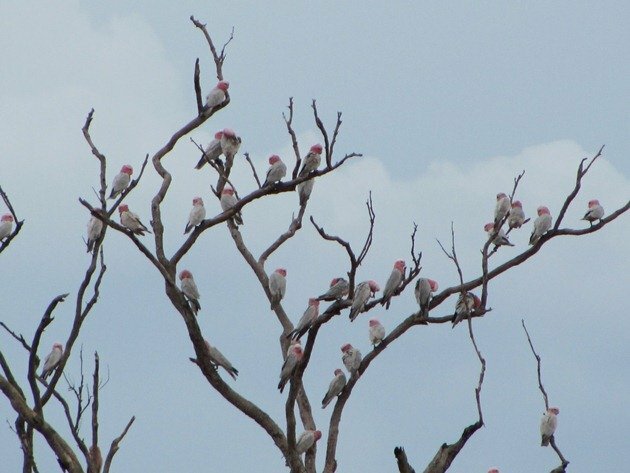 Around Broome the Galahs will gather in trees near ephemeral lakes and then move on together as a flock. 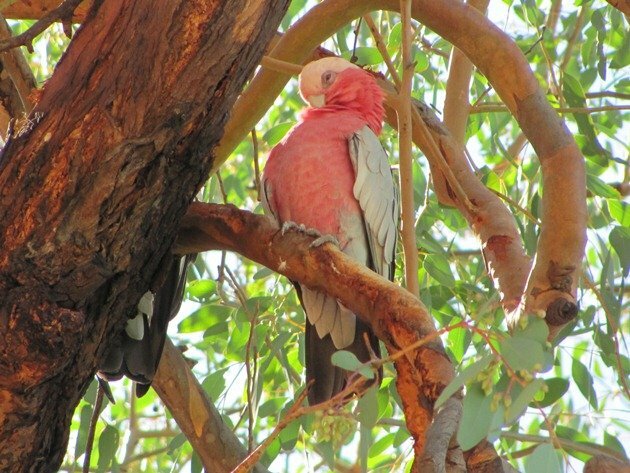 In Queensland the birds are much pinker as demonstrated in the bird photographed below preening itself. 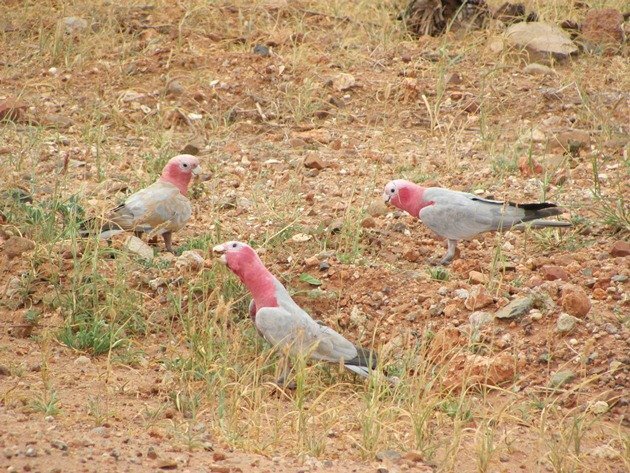 In Karratha, in the north of Western Australia, the birds are also paler pink and are often found beside the road eating seeds. 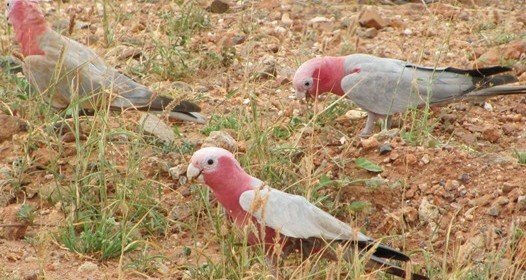 Most people in Australia have heard the words “You silly Galah” and it basically implies that you are a bit of a fool! These birds do appear to act a bit foolish and we have seen them swinging on wires. 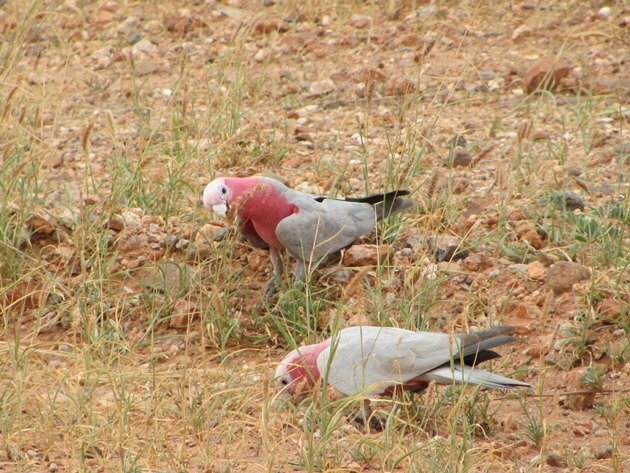 On one occasion some children were deprived of their education in the bush for some time thanks to the antics of some Galahs swinging on the School of the Air communication cable! 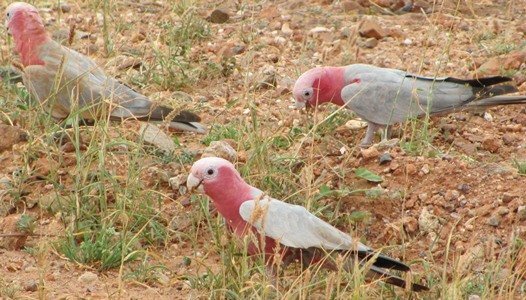 Now, if you like pink birds and you want more then you need to go back to our Pink Bird Weekend where we promoted our pink feathered friends! What a fantastic species to have as a common bird! Yes, they are…so colourful and often naughty! I managed to see a few in Sydney this weekend. They aren’t hard here, but only in winter. 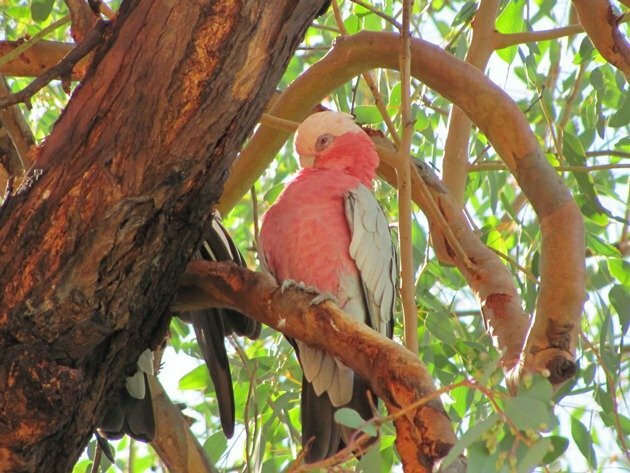 We saw them along the George’s River in Sydney and at Lithgow in NSW. I love the top photo of dozens in a tree. What a beautiful sight! 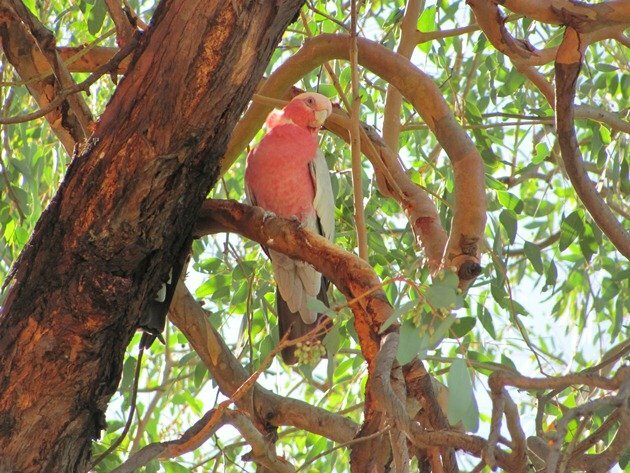 Do you know why the Galahs in the north are paler? Does it have to do with their diet? Wendy, I don’t think it is their diet….just a sub-species. Terrific photos. 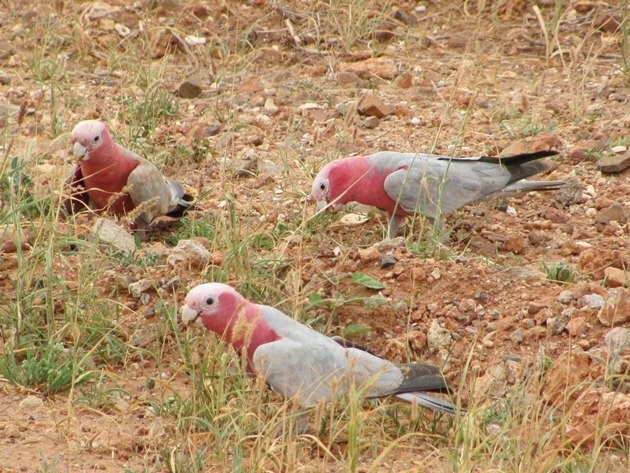 In Queensland we often see great numbers of them perching on power lines or eating seeds on suburban footpaths but you never get tired of looking at them. Yes, Noel…you don’t tire of them! Quite characters! There were not many in Charleville earlier this year, but they do disperse around the country.